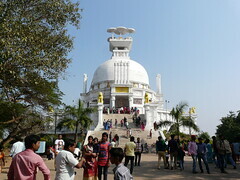 Since the antaralay and shrine room are raised on a plinth and the pradakshinapath is not, there are stairs on both sides of the antaralay that lead down to the pradakshinapath level. 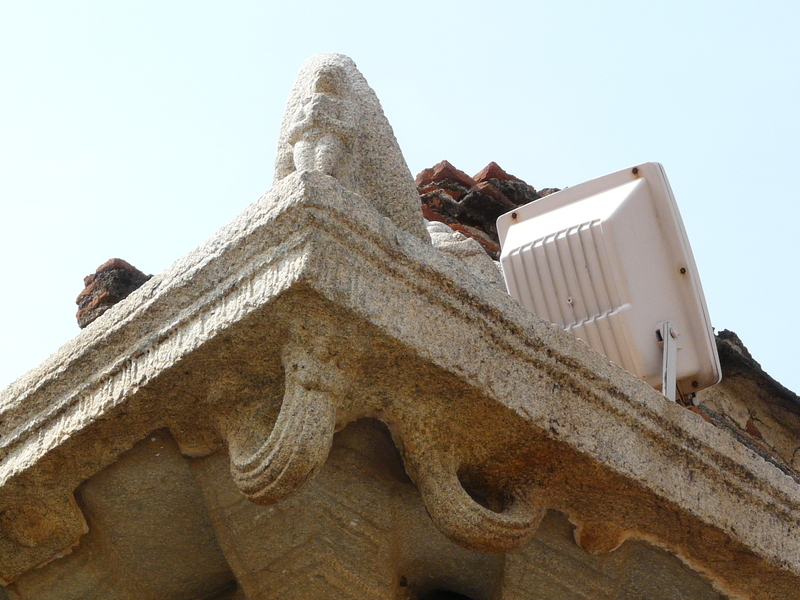 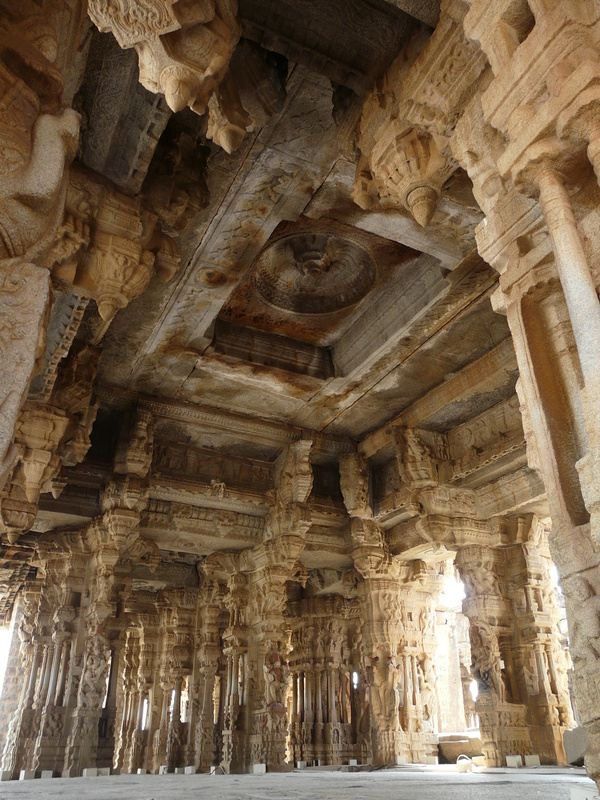 This is interesting because in many other examples of south Indian temples, the antaralay has stairs that give it direct access from the outside. 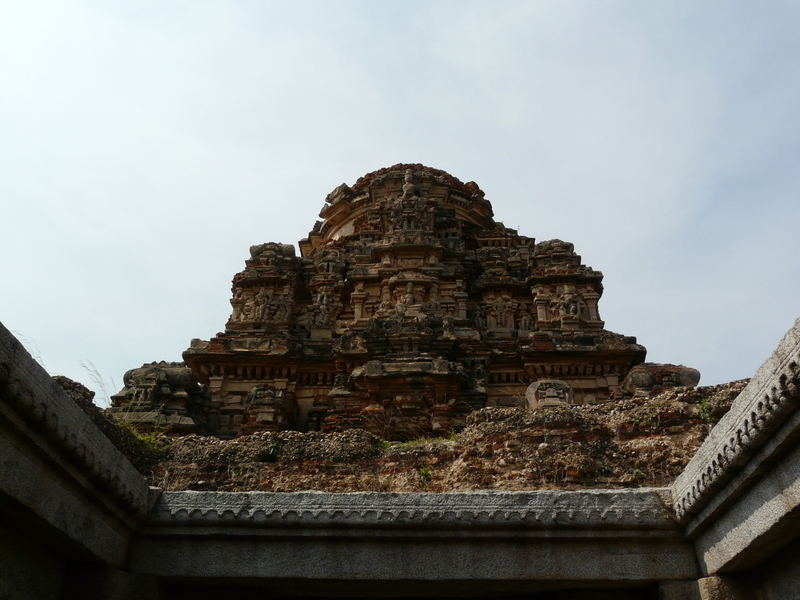 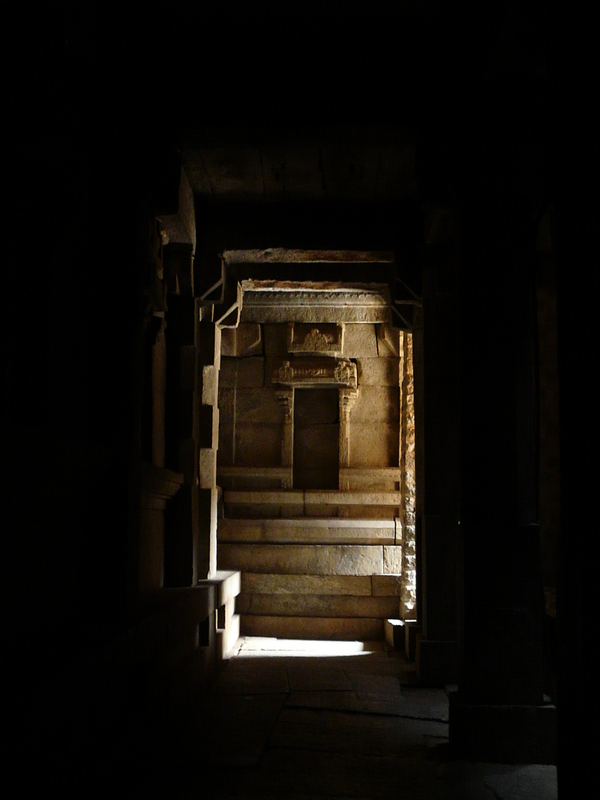 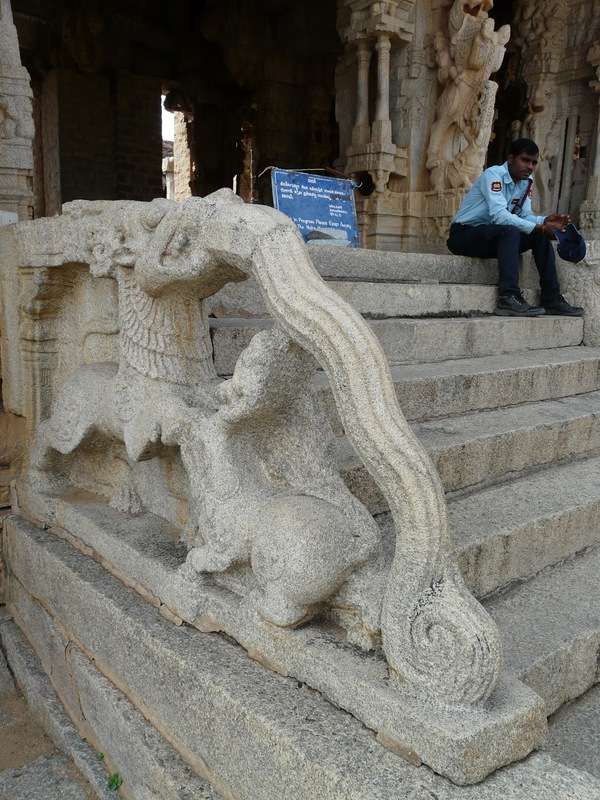 In Vijaynagar temples, the antaralay still has stairs, but they lead down to the enclosed and covered pradakshinapath space. 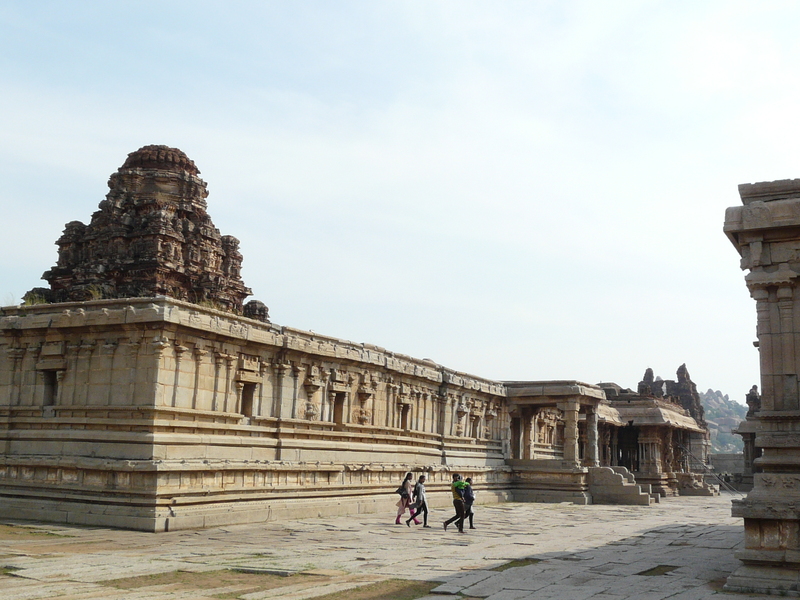 All of this follows the usual Vijaynagar temple pattern. 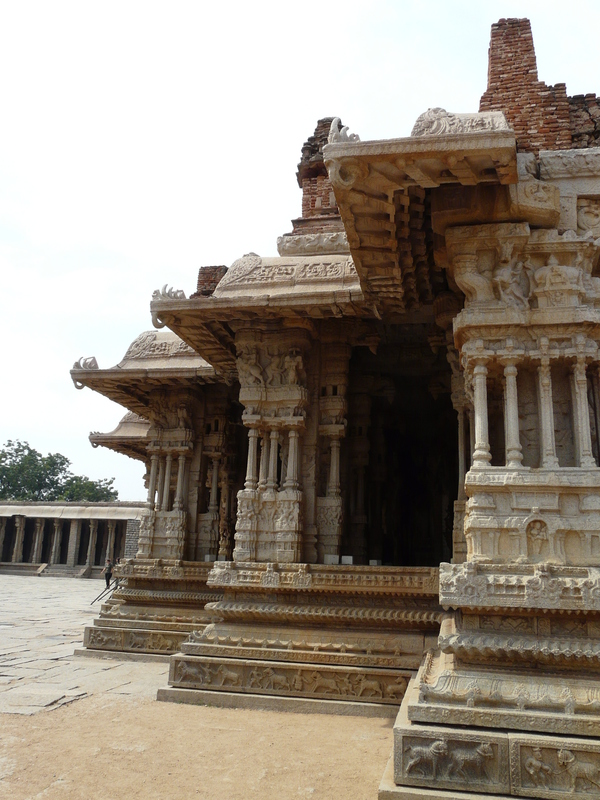 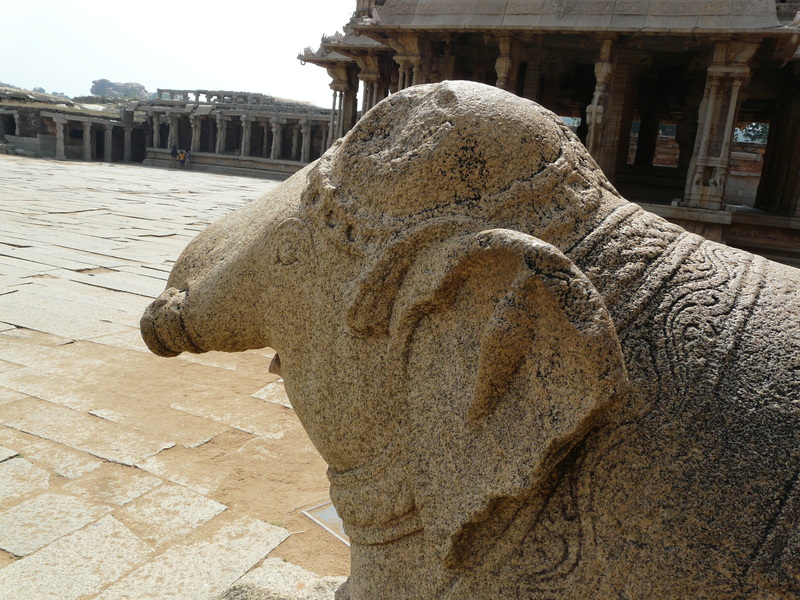 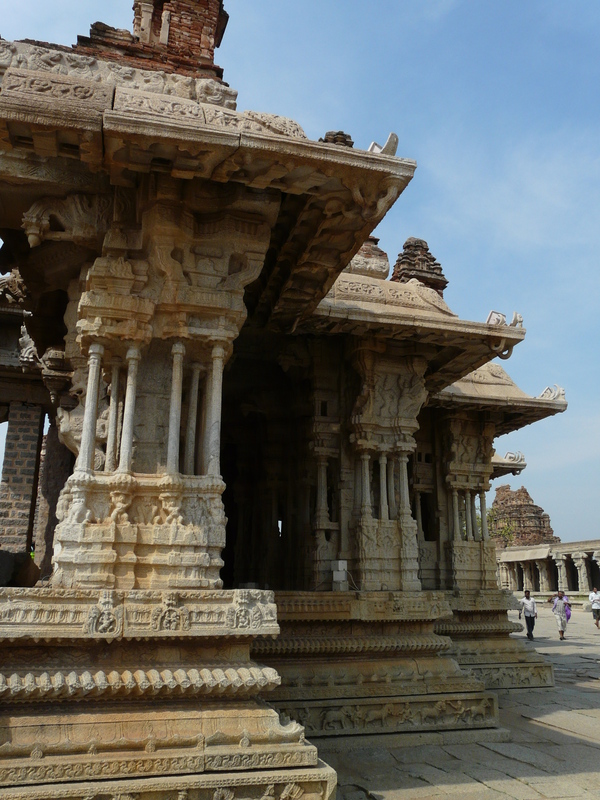 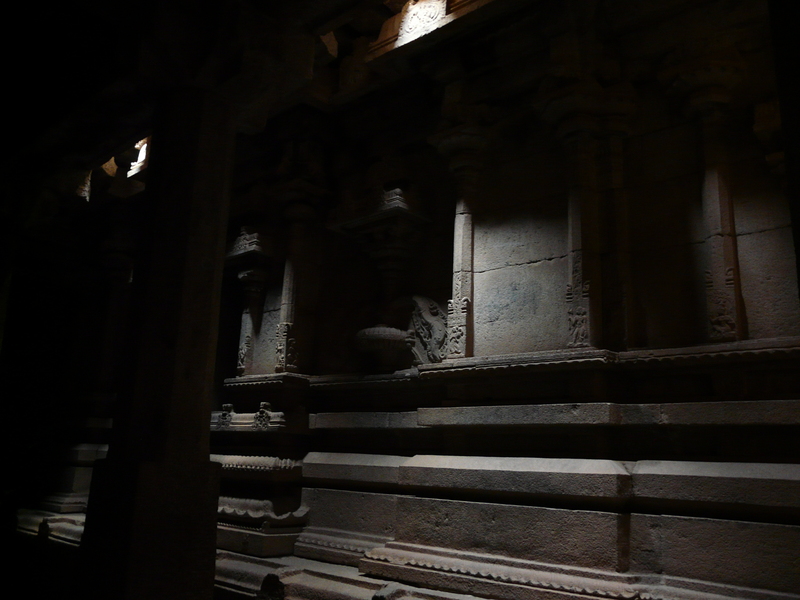 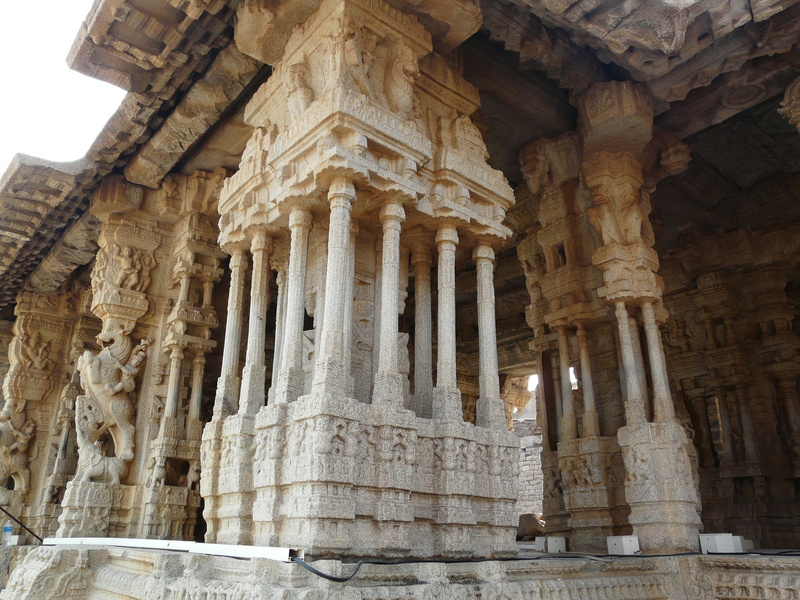 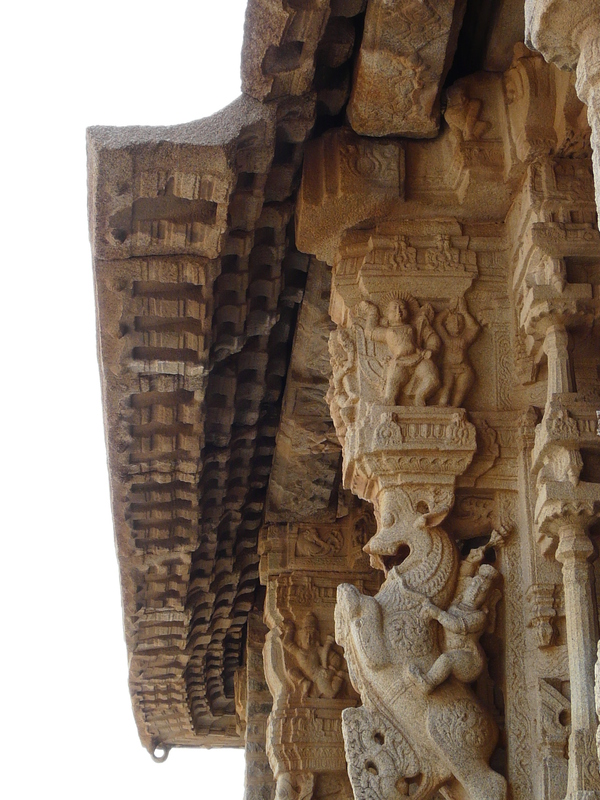 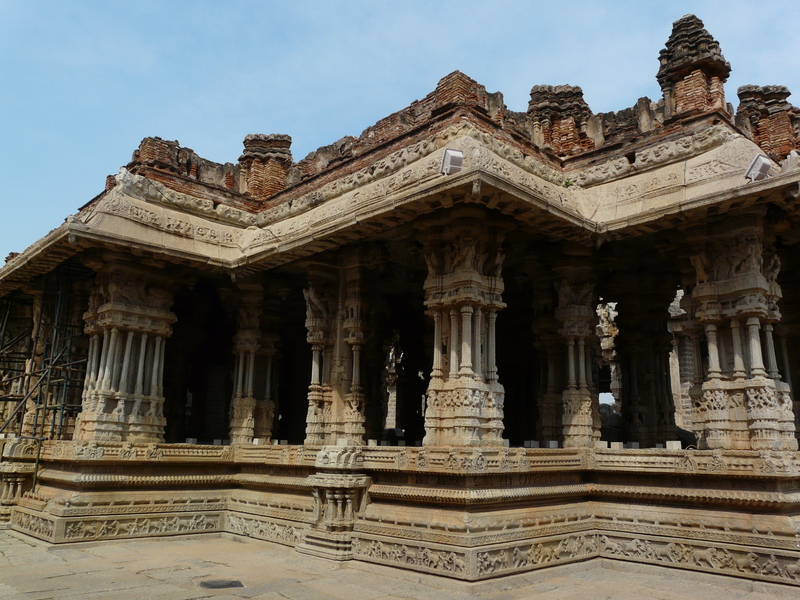 What makes the main structure of Vitthala Temple special is the design of the mahamandap and the sculptural treatment of its columns and other surfaces. 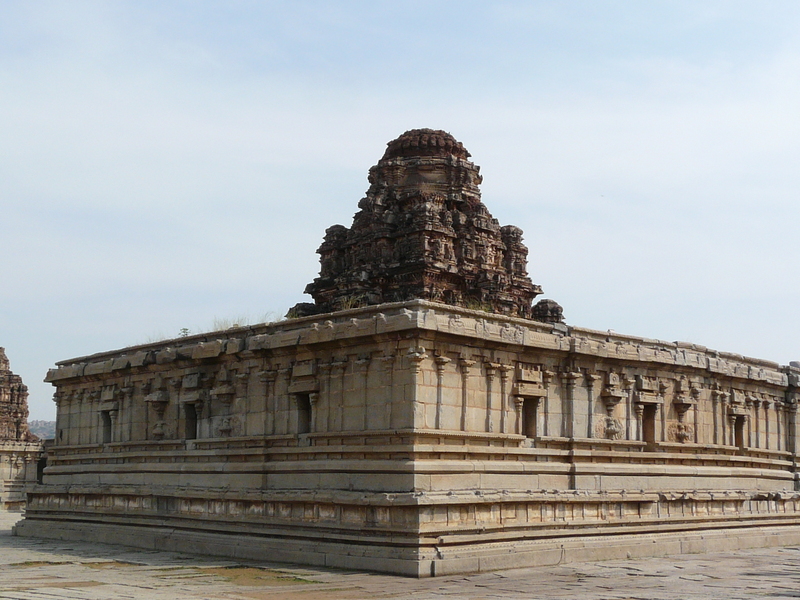 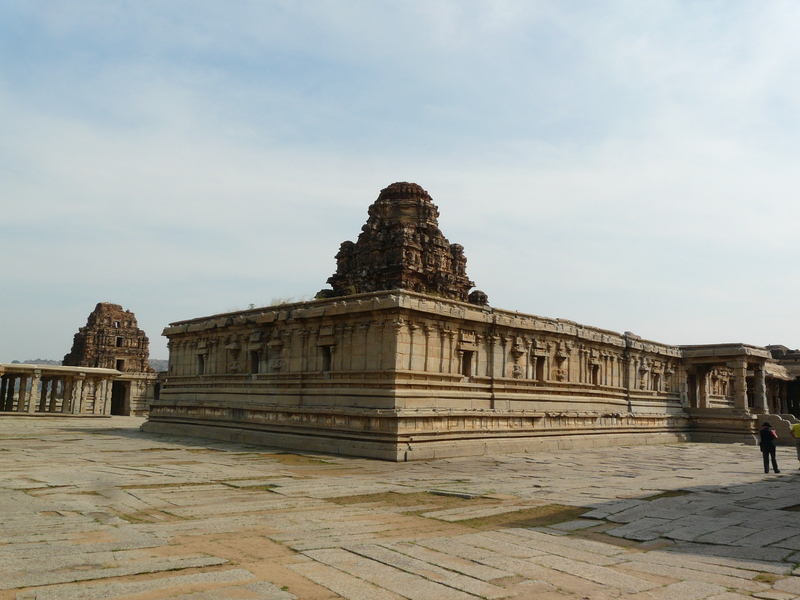 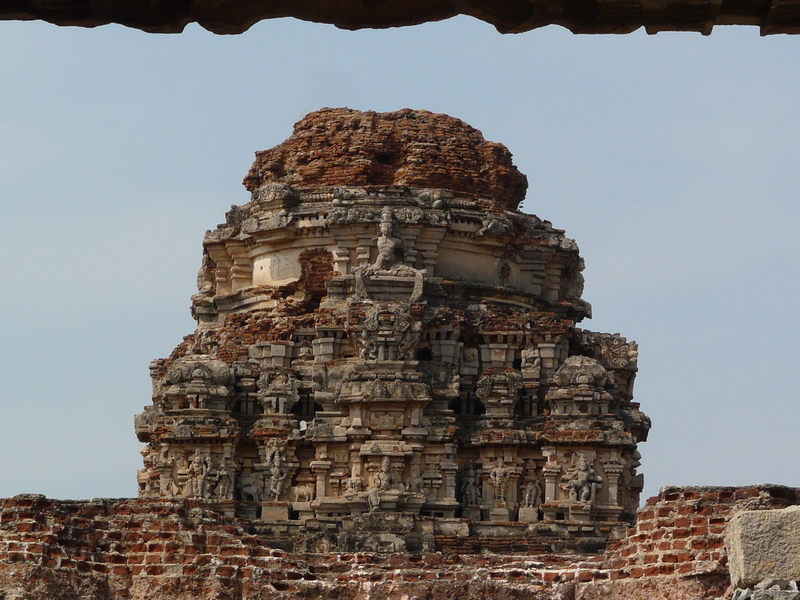 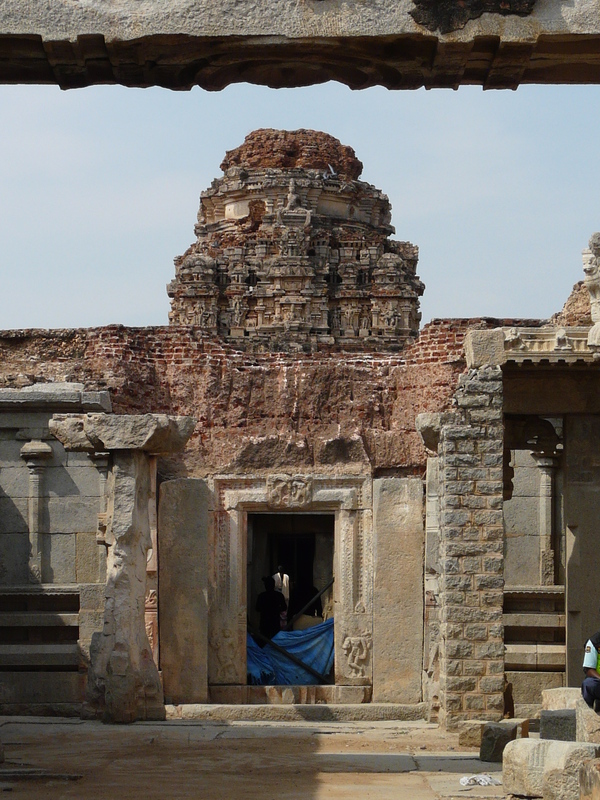 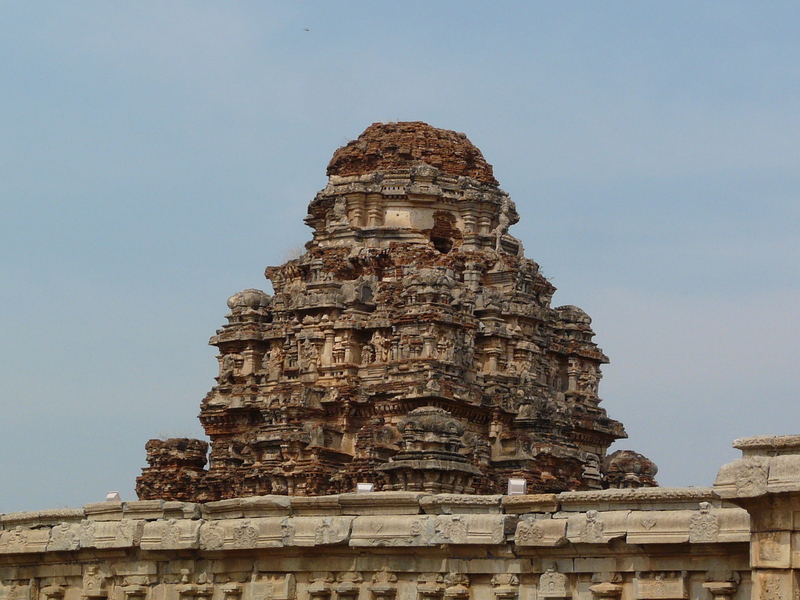 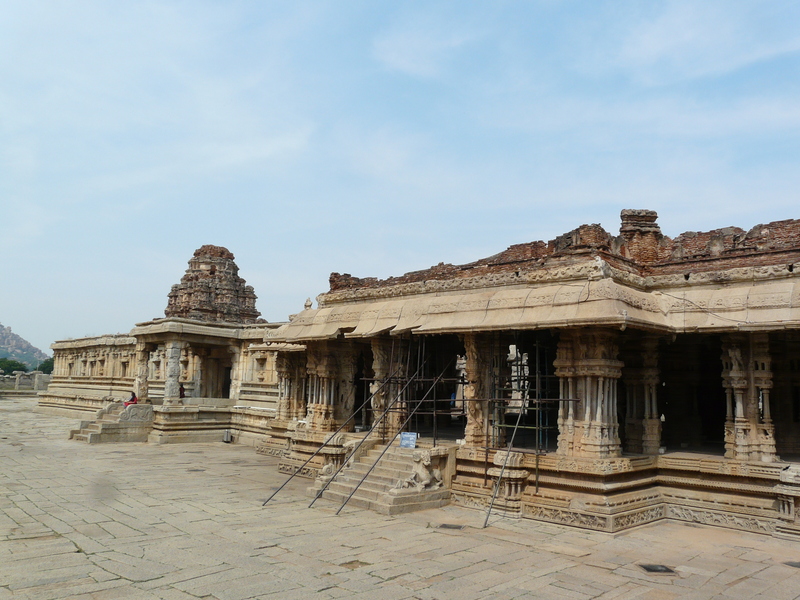 The mid-16th c AD mahamandap is not rectangular in plan as in the Virupaksha Temple (early-16th c), but rather more complex with a repeatedly recessed/stepped outer boundary that creates a “star” shaped plan, providing more opportunity for dynamic viewing of the outer columns. 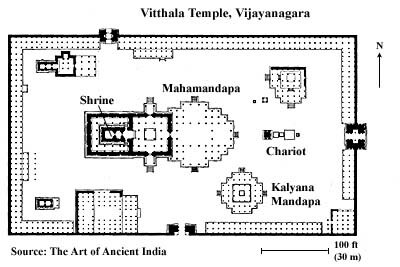 In the Virupaksha Temple, there is just one rectangular aisle space at the center of the mahamandap surrounded by two concentric rows of columns. 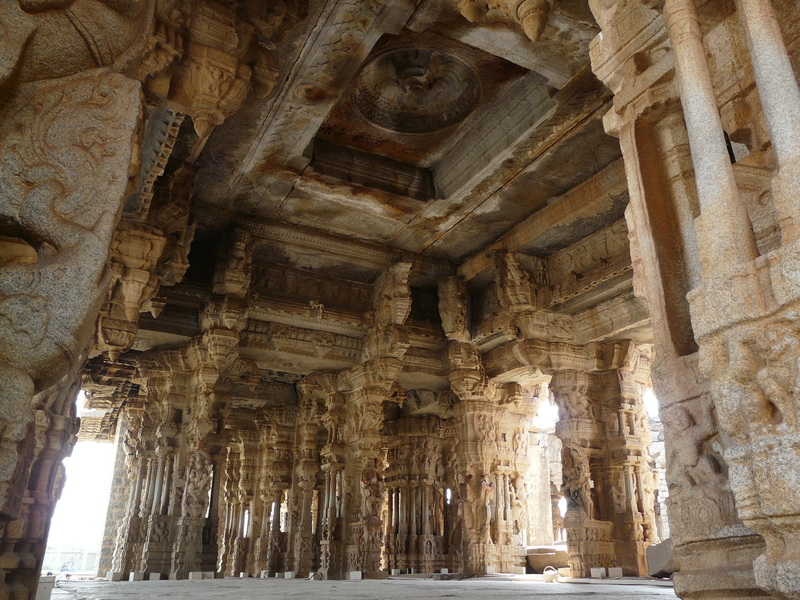 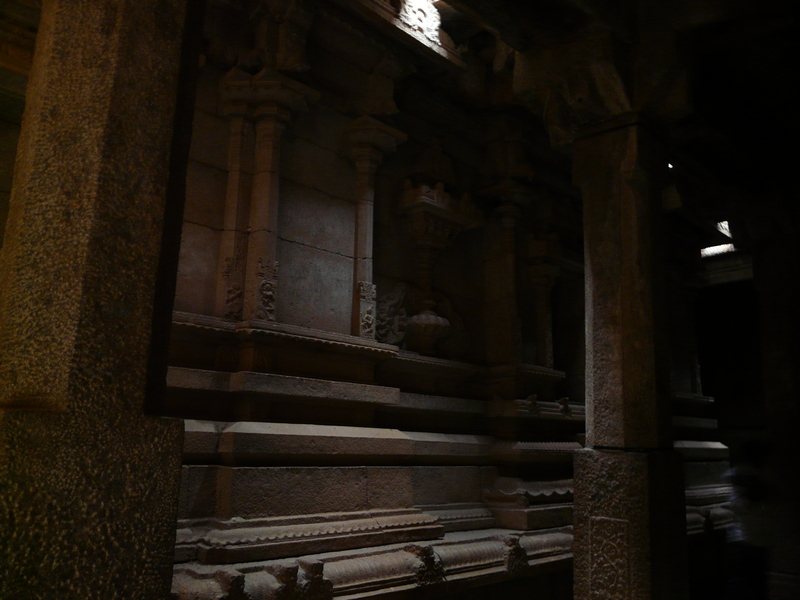 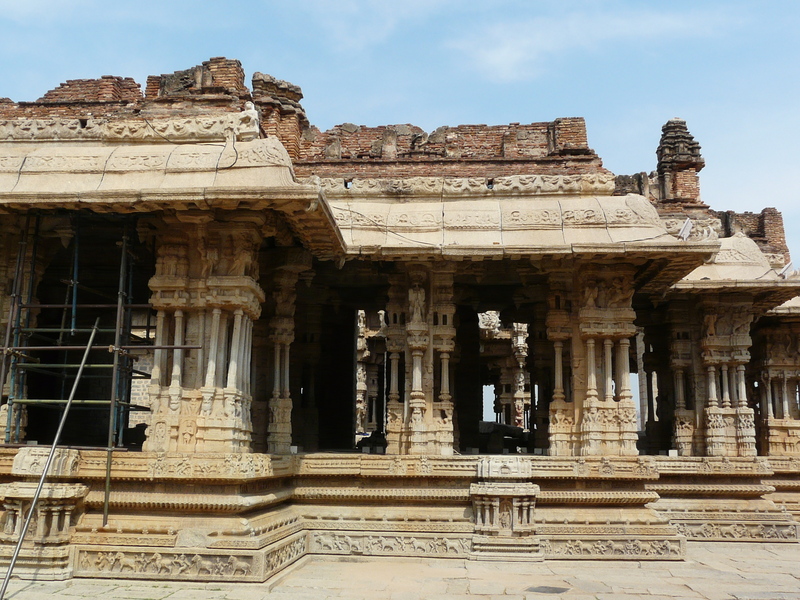 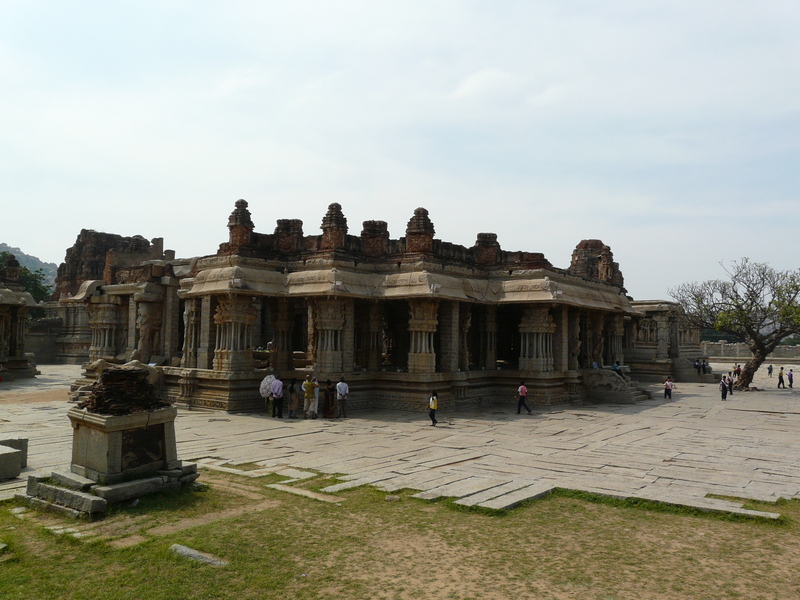 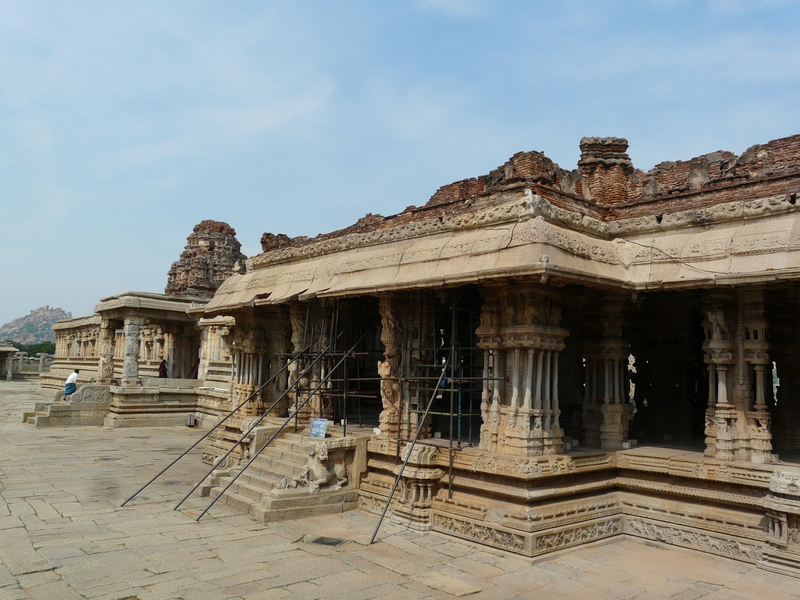 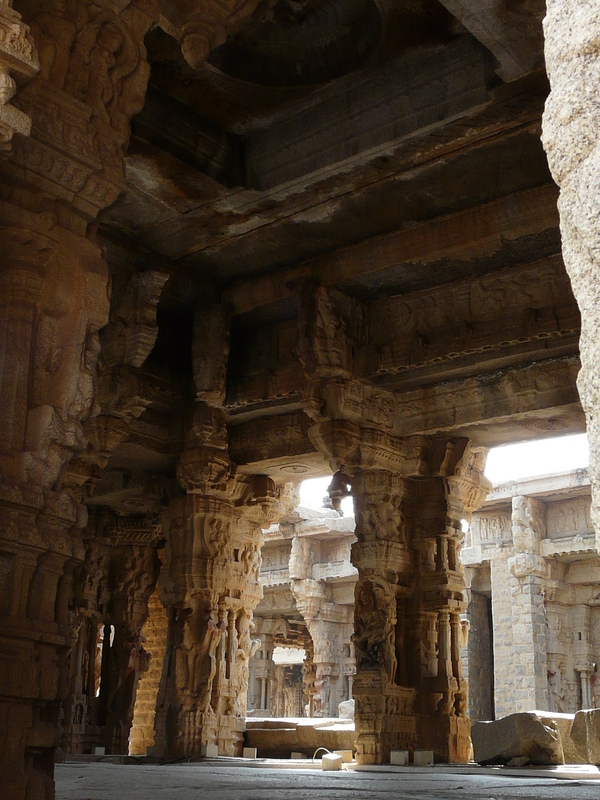 At the Vitthala Temple the central rectangular space is flanked on three sides by square spaces, all within the mahamandap, with all these spaces surrounded by columns. 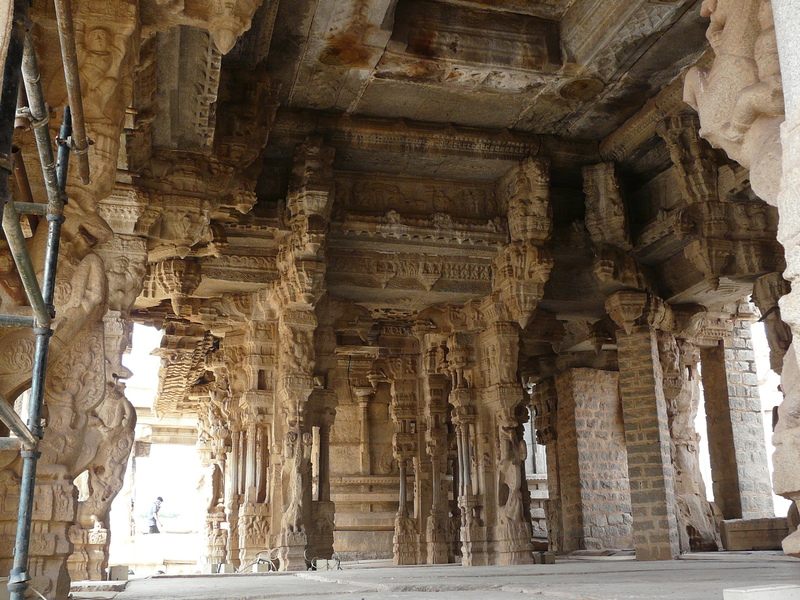 Some of the intermediary columns therefore face open spaces on both sides, and are decorated accordingly. 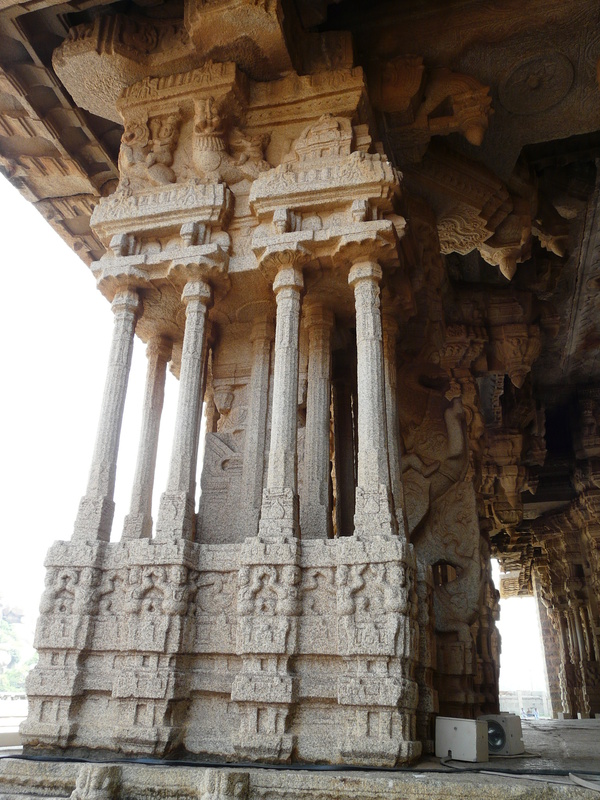 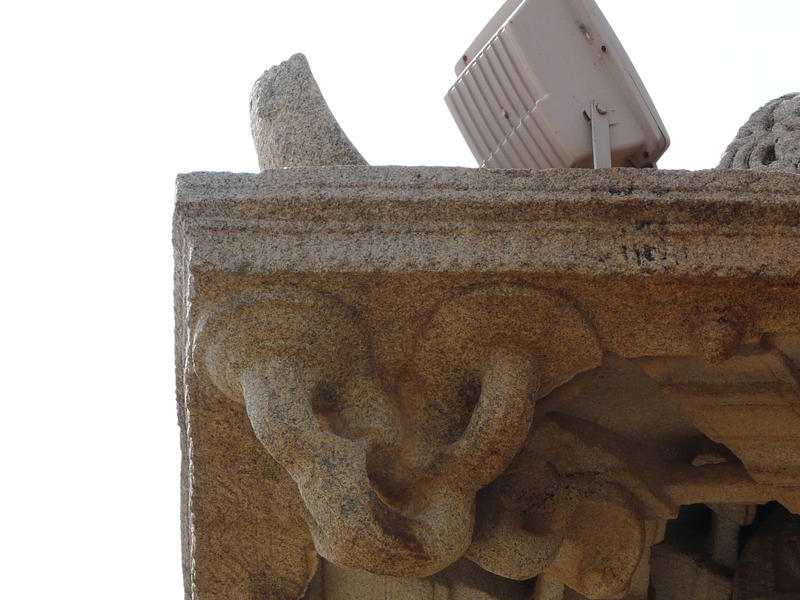 At the corners of the mahamandap, these huge composite columns create the ‘forest of columns’ effect we see often in Vijaynagar temple architecture.